If you like gnawing and sucking on bones this recipe is for you! A very simple and rustic dish I love to make. Just so long as you have about 3 hours to spare, that is. Drain and pat dry. 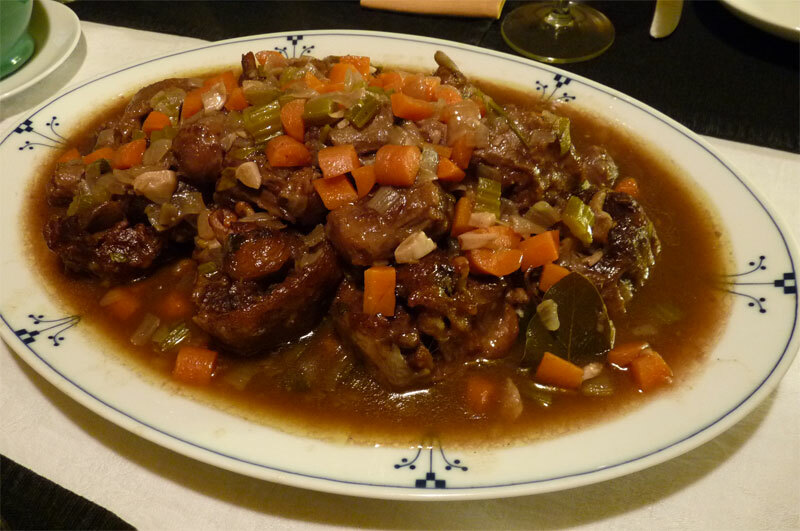 Season oxtail with salt and pepper then lightly coat with flour. Brown oxtail on med heat using half the oil. Work in batches until all the oxtail is browned adding more oil if needed. Put oxtail in a large roasting pan. Preheat oven to 325. In the same pan, removing any burnt bits, add the vegetables and butter and saute for about 10 min, until softened. Add wine and cook until it is almost evaporated. Poor the veggies and remaining wine from the pan over the oxtails. Add the sage, bay leaves, parsley, anise, salt, pepper and 5 cups of water (or broth – I just used the water I boiled the oxtail in, skimming off the scum first). if needed and cook for 30-40 min. In my case I didn’t have to add any but if you do make sure it’s hot. Meat should fall off the bone and have a nice sauce. I like to serve mine on a bed of mashed parsnips but you can also pair it nicely with roasted yams. Hope you like it! Wow, sounds delicious! And pretty easy.